WASHINGTON -- Barely an hour after President Barack Obama invited congressional Republicans to post-election talks to work together on major issues, the Senate's GOP leader had a blunt message: His party's main goal is denying Obama re-election. 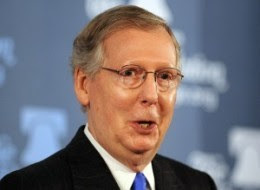 In a sign that combat and the 2012 elections rather than compromise could mark the next two years, Sen. Mitch McConnell on Thursday called for Senate votes to repeal or erode Obama's signature health care law, to cut spending and to shrink government. "The only way to do all these things it is to put someone in the White House who won't veto any of these things," McConnell said in a speech to the conservative Heritage Foundation.